These festive sugar plums are made will all raw, healthy ingredients for a nutritious spin on the classic sugarplum recipe holiday candy treat. *Note: this post for sugar plums was first published on 12/10/2011. The photographs have been updated and the recipe slightly tweaked for an even tastier little bite. These festive treats come together in just minutes, are no-bake and yet filled with all those honey and spice holiday flavors you love. They’re perfect with a cup of tea in the afternoon but special enough to pass as dessert too. Hope you whip up a batch and try them out! It’s December 10th, there are 15 days until Christmas and there isn’t a single decoration up in my house, a holiday card sent nor a present bought. Usually, I’ll be cooking with a glass of wine and Christmas music on in the background this time of year. Lately though, it’s just been the normal Pandora stations with that glass of wine. I have no idea why I’m not into the holiday season this year, but I’m not. Like, at all. The thought of the mall sickens me. The thought of spending hours decorating makes me cringe and let’s not even talk about the the thought of cleaning up and having to put those decorations away come January. If I wasn’t still into baking holiday treats like sugar plum candy I’d probably be googling some sort of holiday depression disorder to try and figure it all out but have no fear, that part of me is still alive and kicking! I think I just belong in the kitchen, not on HGTV. And I’m cool with that. Have you ever heard of sugar plums? And no, not the kind in the Nutcracker that dance around all daintily on stage. Funny side story on the Nutcracker actually…my grandparents took me to see the performance in NYC at Lincoln Center when I was pretty young, definitely elementary school age. We got dressed up for the event and my grandmother let me wear one of her short mink fur coats. She’s pretty short so it fit me at the age of 8 or 9. Many years later I found out it was a PETA group, which totally makes sense in retrospect but as an 8 or 9 year old, I had no idea who those people were and why they were yelling at me. I was sassy as a kid. I still am. Since I love a good ball, I decided to make my own healthier interpretation of this classic holiday recipe with stuff I had on hand. 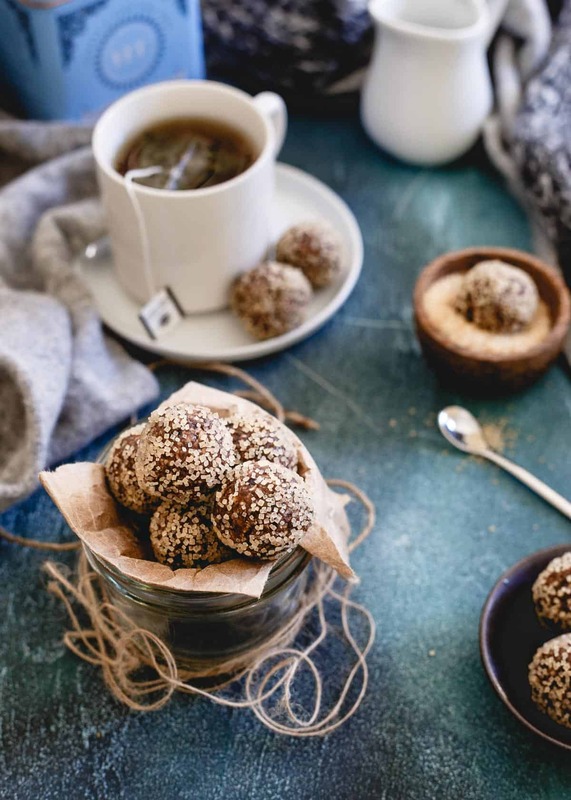 More holiday ball/bites inspiration –> cranberry orange oatmeal cookie bites, gingerbread chocolate chip bites, dark chocolate kahlua coffee bites. I’m not sure what I expected from these sugar plums but they taste how I imagine a fruit cake rolled up into a ball, coated in sugar would taste like. Disclaimer, I’ve never had fruit cake before so I’m not totally sure of the accuracy of that statement but a quick google search tells me it’s basically a cake with a bunch of dried fruit in it (shocking) so I’m sticking with that comparison. Sugar plums (or, sugarplums as they’re referenced both ways) are not actually sugar coated plums as in the fruit despite the name. They seem to have morphed over time from a simple sugar coated seed, nut or spice (some say it was sugar coated coriander way back in the day!) 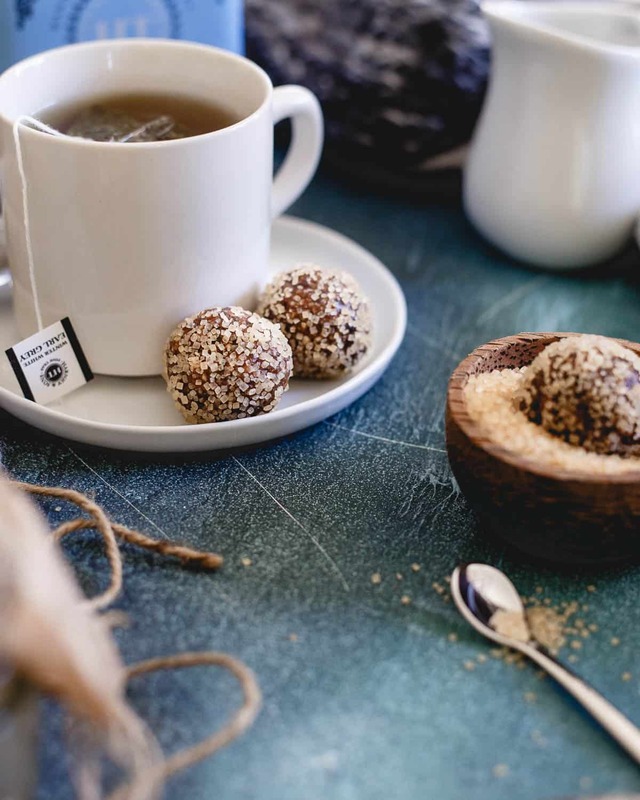 into what they are today which is basically a combination of dried fruit, nuts and seeds rolled into a ball shape and coated in sugar. For this healthier spin on an modern authentic sugar plum recipe, almonds, prunes, dates and raisins make up the base. Spices like cinnamon, nutmeg and cardamom then combine with vanilla, almond and anise extracts for a holiday spiced treat. I chose to use sugar in the raw for the coating on these sugarplums but another option is powdered or confectioners sugar for a more traditional look. While I’m not feeling a ton of holiday spirit this year, these are such a great little Christmas bite. They’re no-bake, easy to throw together and bring all the flavors of the holiday into a healthier version of the classic candy treat. If you’re looking for an indulgent holiday dessert you can always make this apricot brandy pound cake but for something traditional and a bit easier on the waist-line this recipe for sugar plums is a great option! Also try nutella cookie dough balls or raw brownie bites. Don’t forget to check out all my Christmas recipes too for more inspiration! 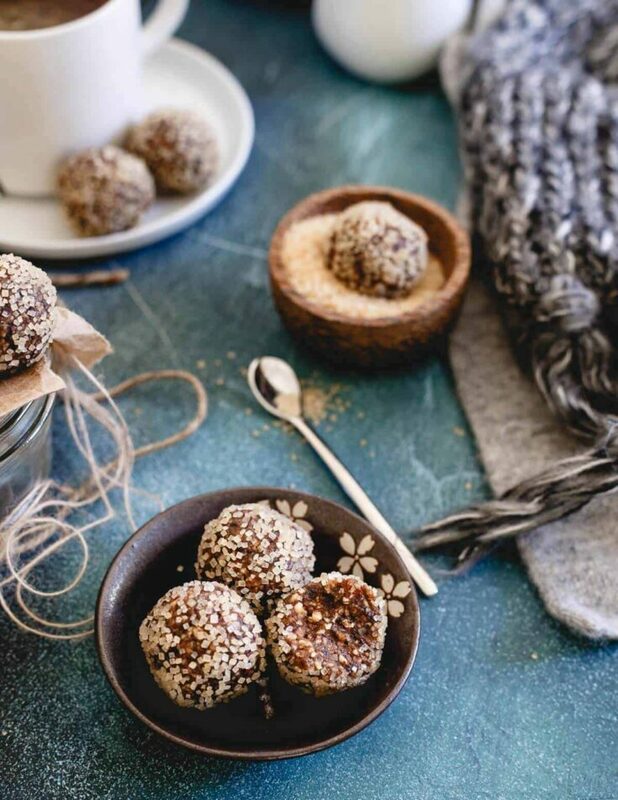 These festive sugar plums are made will all raw, healthy ingredients for a nutritious spin on the classic holiday treat. Combine nuts and fruit in a food processor and pulse until it becomes finely chopped but before it starts to form a ball. Transfer mixture to a medium bowl and add remaining ingredients. Combine/mix together with hands. Roll into balls and set aside. Add sugar to a shallow ball and roll balls in the sugar until completely coated. These look great! 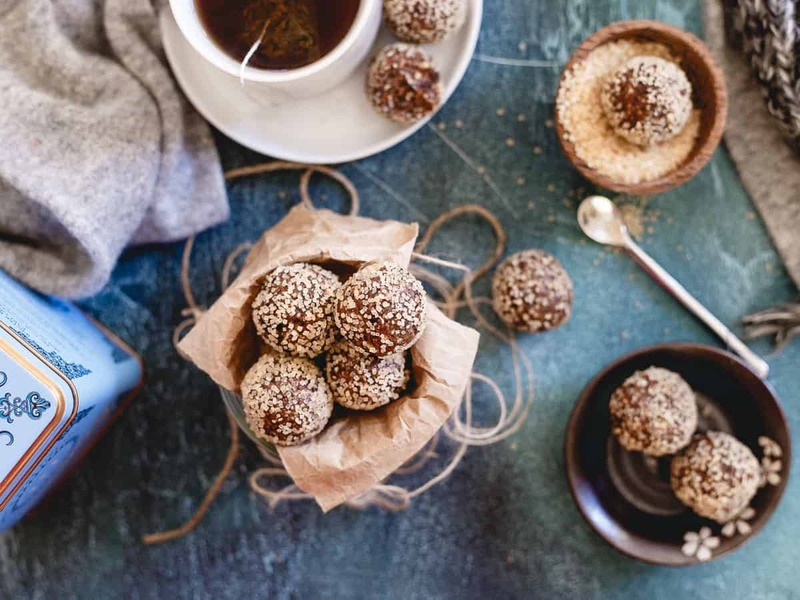 I’m a big fan of balls made with dates, but I usually keep it simple and just add almonds, oats, coconut and maybe almond butter. All the ingredients in these sound fabulous though. I’m definitely going to try these. Can I eat the whole batch? What an awesome, healthy little holiday treat Gina! I’m in need of healthy anything right now!! Such a delicious healthy holiday treat to add to the mix of not so healthy treats everywhere I look! Gorgeous photos too! Loving these sugar plums!! So cute! Love that you put a nutritious spin on these! These look great! Love your photos as well! What a beautiful presentation! These look amazing and I cannot wait to try them! !